Going down Bean Shoals is probably my most favorite part along this section of the Yadkin. It will test your skills to “read” a river, maneuver quickly around obstacles (rocks) and make quick decisions on the best course to pursue. My instructions to anyone who accompanies me on a paddle down Bean Shoals are simple: “Our main objective is not to rip out the bottom of the canoe.” I’m not joking. Technically, Bean Shoals begins about a half mile from the Shoals Road put-in, although there are plenty of rocks leading up to it that provide the paddler with some “warm up” exercises. The complexion of Bean Shoals is entirely determined by the height of the river. When the water is high, the river runs fast; and there are fewer visible rocks. In many cases you can glide right over them. It can be really fun. When the river is lower, there many more exposed rocks which pose navigation and potential collision challenges. I often feel like I’m paddling in a pinball machine. In a very general sense, staying in the main channel, close to the north bank, provides better canoeing options. The middle channel is extremely rocky, even with high water, and requires walking the canoe down most of the length between the two islands. This middle channel will eventually merge with the south channel. Likewise, the stream along the south bank is very rocky and necessitates walking the canoe for a good while. But once you pass through the rocks it is fairly navigable and takes you along a trail that is also part of Pilot Mountain State Park. The shoals are about a mile long. I am prone to jump out the canoe at a moment’s notice to prevent getting hung up on a rock or end up perpendicular to the river current – a dangerous position to be in. Keep in mind that when you look to your right (south) you see Fishing Island, not the south shore line. As you look to the left, keep an eye open for the canal project wall which is visible at times. The constant sound of churning water over the rocks, the tree-lined river banks and the apparent solitude provide an enduring impression to anyone who makes this venture. After completing Bean Shoals, it’s not a bad idea to pull over for a quick break. The east end of Fishing Island is a pretty good spot. It’s now been about an hour since putting in, and ahead is the Great Bend area of the Yadkin which I cover in my next blog post. More later. 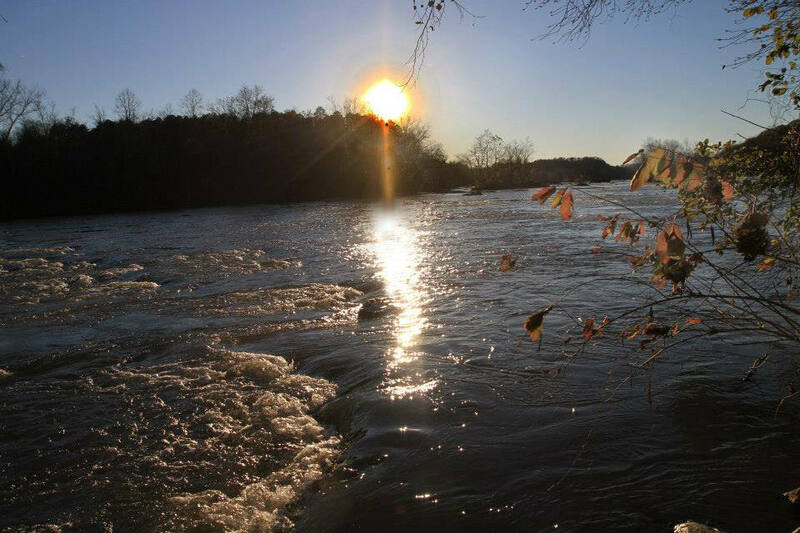 Adventures on the Yadkin River is written by former journalist and life-long river enthusiast, D.R. White. He is a self-proclaimed guardian of the Shoals Road to Donnaha Bridge section of the Yadkin River. Over the course of the next few months, he will bring this stretch of the river to life in words.